how accurate are those QV valuations? It’s a question we’ve put to a few real estate agents and the consensus is that some are accurate and some are not. The problem is that QV does not inspect any properties to come up with their figures: it uses information from official sources: actual sales in the vicinity, LIM report changes and (one assumes) details of building consents issued by the council. These facts get entered into its computer modelling. General land values (unimproved site values) should be reasonably accurate, but QV’s capital values can be seriously out of whack. A couple of months ago we mentioned a property near the beach which contained a bach of only 40 m² from 1945 plus a one car garage — the two structures were valued by QV at $185,000 (plus the land value). How much does that matter when it comes to Rates? In Kapiti the land value is the more important figure as 37% of what you are hit for is determined by it, while only 6% comes from the capital value (the whole property’s value). But 51% comes from fixed charges. This breakdown is contained on page 3 of a pdf downloable here. Not every council has the same mix; in fact it differs substantially. Wellington City, for example, is nearly 90% capital value. 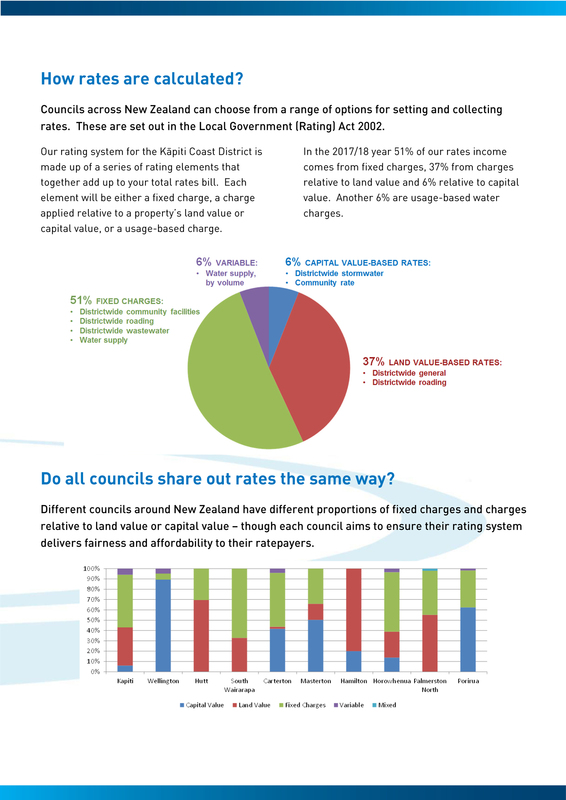 “Each council aims to ensure their rating system delivers fairness and affordability to their ratepayers.”? Well, we submit the KCDC definitely doesn’t.